I have a Arduino Nano (link) bought on eBay. And the NRF24L01 module also bought on ebay (link). The NRF module do not have any markings of the pins and the ebay product page do not contain any information either. I've therefore assumed that the pins are the same as on the tutorial page (link). �0;0;3;0;9;radio init fail" after trying to rewire it all from scratch. I'm using OSX 10.11.3 and Arduino 1.6.7. Though not sure if that is relevant. Do you have any tips as to what I'm doing wrong? @Christian-Simonsen Hard to tell. By the looks of the picture of your NFR24L01+ it's the same pinout as on the MySensors build page. Always power the radio with 3.3V never 5V (which I assume is your VCC pin). Add a capacitor (4.7uF) as close to the radio as possible. (I always stick them, in the female pins of the Dupont cable). Double check the wiring. Make sure that MOSI and MISO aren't changed e.t.c. Also set your serial monitor to 115200 baud, to might get rid of the strange symbols in your output. I have a couple of Nano based sensors which are running for more than half a year without any problem. So I guess my wiring is correct then if I understood you correctly. VCC is 5V and should not be used in my case. - I already have a 4.7uF (50V) capacitor between GND and VCC on the NRF board, done the same way as you describe. I uploaded the sketch again to the Arduino, and this removed the strange symbols in the Serial Monitor. Now I get "St0;0;3;0;9;radio init fail". I've also replaced the NRF module with another one ( I have 10). This didn't work either. Do I need to change anything in the sketch? eg. the input pins on the Arduino? By the way - I see no lights (LEDs) or signs that the NRF module receive any power. Not sure if there are any tiny LEDs on it... but it seems like it is.. In case it was something wrong with the Arduino Nano, I've replaced it and tried another. However Im still getting the same error. "0;0;3;0;9;radio init fail". I have now also tried the long-range version (link) and Im getting the same error. "0;0;3;0;9;radio init fail"
@Christian-Simonsen what is the log saying when you monitor the gateway with serial monitor? also query this forum for St0;0;3;0;9;radio init fail. It might help you. Some reading regarding + and not + Nrf modules. The chip marking is "NRF M 24L01+ 1452AB" - so I assume it is a + module. I've tried to rewire it multiple times, I will try again. See the threads i posted, there are alot if images.. maybe you can see something there. Or post a picture of your radios here... maybe we can spot something if you suspect its a fake. Also - how do you power your node? I'm using both NRF24L01 and NRF24L01+. You have to change the datarate in the MyConfig to 1mb to be able to do that. Fake NRF chips seems like the most plausible reason so far. The chips do look of bad quality.... but whether the chips are the issues or not is difficult to say..
Can you judge from the pictures? No - its not possible to say exacly. Its defenetly a fake - but how bad, not possible to say. but I also recieved a batch yesterday without markings - and the one i used today worked great! 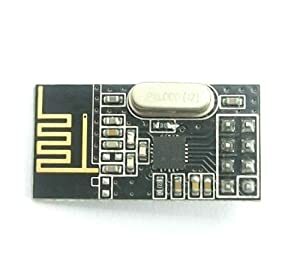 Is there a sketch that I can use that I can use to test/debug the NRF module specifically that might help identify what I am doing wrong or the if the module is bad? I found the TMRh20/RF24 library on GitHub and I uploaded the GetStarted sketch to the Arduino. Not sure if it is working but atleast a lot started happening in the Serial Monitor. To me it seems to work..
Now I have also tried the original RF24 library by ManiacBug (link). And I got this results in the Serial Terminal. The odd part is, why do I then not get the MySensor SerialGateway sketch to work... any thoughts? This isn't working at all. First, yes you have fake chips, I have the same ones, but they work with the RF24 library just fine so far. Second, the payload should be either the current microseconds or a steadily incrementing number. The payload you're getting is the result of either bad power or incorrect pin out to your controller, usually the CE and CSN are wrong.